What is there to say about the American turkey that hasn’t recently been said? 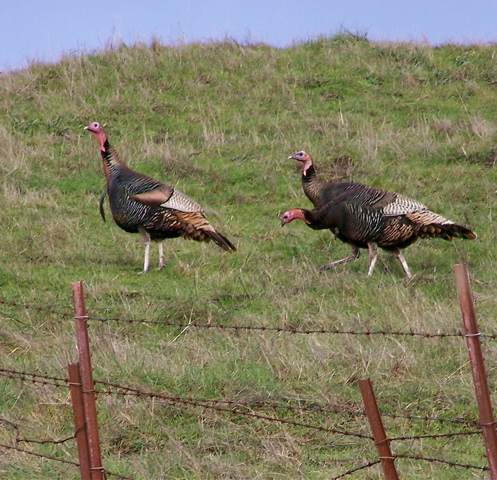 In the last 20 years, wild turkeys have spread throughout West Marin. 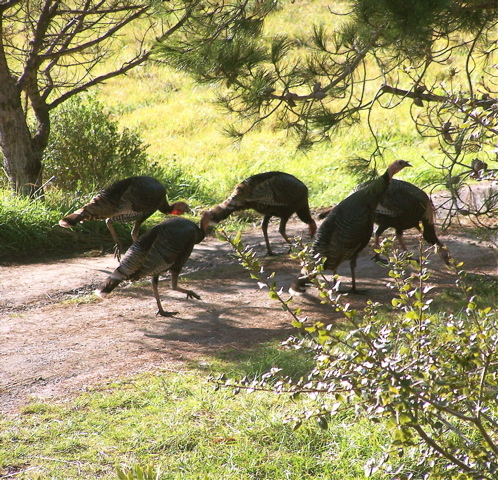 I grew up in Berkeley and six weeks ago attended a New Year’s Eve party there; to my surprise, residents of my old neighborhood were likewise talking about wild turkeys moving in on them. Well, how ‘bout this curiosity? Why does the bird have the same name as the country? As it happens, Turkey was the talk of the world’s chattering classes this past week after Turks voted that henceforth women can wear headscarves in universities. But getting back to the coincidence of names…. The African bird which the English confused with the American turkey was the guinea fowl, The American Heritage Dictionary notes. 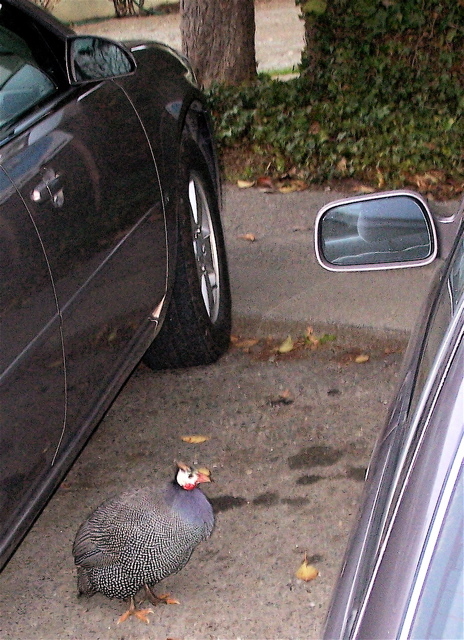 As it happens, for the past two months that bird has been the talk of Point Reyes Station’s chattering classes, such as we are, because a representative of the alien species has been walking the streets of town. The first report of that streetwalking was published in this blog Dec. 16. Yesterday, The Point Reyes Light reported that after two months of hunting and pecking throughout Point Reyes Station, the bird has now been caught by Station House Café employee Armando Gonzalez. Anyway, down here in Colombia, we went on an epic adventure yesterday — crossed the border over to Venezuela via Cucuta’s overloaded, one-lane bridge and surrounded by trucks laden with cocaine and other contraband. Definite no-man’s-land here… It’s good to see bits of news like this once in a while to remind us of a more-settled, calm way of living. I’ll send you the link to the story about Cocaine Highway when I blog it. Dave LaFontaine and Janine Warner are currently conducting the second in a series of online-journalism workshops at newspapers throughout Colombia. Whoops – sorry – I shoulda given some more context here about where we were and what we were doing … chalk it up to a long, long day at the end of some very long weeks far from home. Thanks for the contextualizing here, Dave. We’re in Bucaramanga now, working with the Vanguardia Liberal, a newspaper that stood up to Pablo Escobar back in the day, and for its trouble, was rewarded with about 4,000 pounds of dynamite and a short fuse. True to the unyielding nature of the residents of Santander, they insisted on not missing a publishing date, working on manual typewriters by candlelight to get the next editions out… after that, the narcos started to really get nasty, “disappearing” three carloads of journalists, one after the other. By carloads – again with the need to provide context down here – reporters were not allowed out on assignment alone back in the late 80s/early 90s, because they would so often go missing. So the paper started sending them out in teams – one person would drive and wait in the car, while the other would try to take photos or conduct interviews or pick up documents or whatever. Sparsely Sage and Timely is powered by	WordPress 4.9.10 and delivered to you in 0.304 seconds using 55 queries.